Where is Frankfurt Airport located? Düsseldorf Airport is located north of Düsseldorf and east of the Rhine river. Via exit 31 “Flughafen Düsseldorf” of the A44 motorway you can reach the airport within minutes. The airport has three terminals (A, B and C) and is an important basis for the German airline Air Berlin and Eurowings. What is the distance from Düsseldorf airport to the center of Düsseldorf? Düsseldorf Airport is a short distance from the center, with the car doing 14 minutes on the distance of 9 kilometers. Which airline (airlines) flying to and from Dusseldorf Airport? The full list can be found via this link, airlines Dusseldorf Airport. How to get to by public transport at Düsseldorf Airport? Düsseldorf Airport has the luxury of a private train station (Flughafen Düsseldorf) and Metro (Airport Rail Terminal / S-Bahnhof). From the train station you arrive at the airport by the SkyTrain monorail, this takes several minutes. The metro station is under Terminal C. departs every 20 minutes S-Bahn S11 (Flughafen Düsseldorf – Bergisch-Gladbach) to Düsseldorf Hauptbahnhof to the airport. On Saturdays, Sundays and public holidays runs S11 S-Bahn every 30 minutes. The fifth station Dusseldorf Airport Terminal, also the terminal. Travel time is 12 minutes, a ticket costs € 2.60 for adults for a period of 90 minutes and € 1.60 for children 6 t / m 14 (Preisstufe A). From the Netherlands you can travel to the airport by train from Arnhem and Venlo. The Arnhem travel time to Dusseldorf Airport is 1 hour and 12 minutes, change is necessary to Duisburg main station. The Venlo travel time to Dusseldorf Airport is 1 hour and 22 minutes, in which case you should move to Düsseldorf main station. More information is available here timetable S-Bahn S11 and Deutsche Bahn website. How much does a taxi from your front door to Dusseldorf Airport? 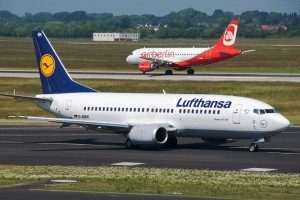 Do you book an early flight from Dusseldorf Airport or traveling just prefer you can get a taxi with the taxi to the airport at one of the many providers. An example is Tinker, they offer cheap taxi transport from your front door to Dusseldorf Airport and back. How much does a taxi from and to Dusseldorf? The price of a taxi ride between Düsseldorf Airport and Düsseldorf city center is € 28. Which car rental companies are present at Dusseldorf Airport? In the central arrivals information counters are located in Avis, Europcar, Enterprise, Hertz, Buchbinder, Budget and Sixt. Through EasyTerra Car Rental you can compare the prices of all providers and immediately take advantage of offers. What are the parking rates at Dusseldorf Airport? Düsseldorf Airport has space for more than 20,000 cars, a large proportion of these parking spaces are covered. The parking spaces are divided into Terminal (Orange: P1, P2, P3, P7, P8 and P22) Langzeit (Yellow: P4 and P5) and Langzeit-Fir (Red: P23, P24, P26 and P13). The last option is the cheapest by the beneficial Langzeit-Spar rate. To be sure of a parking Langzeit-spar, you can make the best booking through the official website. From P24 and P26 drives the Bird Park shuttle bus to the airport every 20 minutes from 3:30 am to 1:00 pm. You can travel on the SkyTrain from the airport and railway station Dusseldorf Airport, the monorail makes a stop at Parkhaus P4 / P5. Check out the full list of Dusseldorf Airport parking fees.